Tim Shaw is an artist and musician interested in the relationships between site, sound and technology. His practice is concerned with the many ways people listen, specifically how listening environments can be constructed or explored using a diverse range of techniques and technologies. 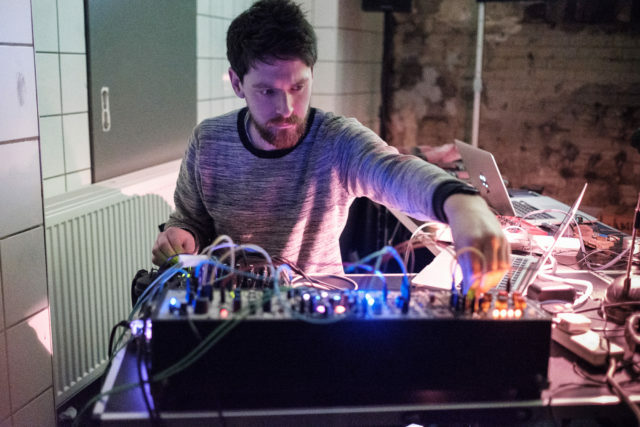 His work is anchored in the creative use of field recordings and he often appropriates recording and communication technology to consider how these devices change the way we experience the world. Tim presents work through musical performances, installations, walks and site-responsive interventions. Can you talk about your background and what led you to recording and field recording in particular? When I was younger my creative practice involved sound design and electronic composition. Through one of my elected courses at University, where I studied music, I discovered electro-acoustic music and got interested in the possibilities of incorporating environmental recordings into my creative practice. I found a more productive relationship with these environmental sounds compared to the studio compositions I had been previously making. With field recording there was a different interaction with the sonic material, listening became a more dominant action, and this workflow felt much more suitable for me at the time. As a consequence, these sounds became more and more present in my work. Through this I started experimenting with presenting through installations as well as performances. I recently finished a practice-based PhD looking at the relationship between sound art and technology. By doing this I opened up a whole bunch of new ideas which connect my practice to field recording, listening, technology, limitation, interaction and performativity. Though I still love recording and exploring the world through listening, I do sometimes get frustrated with some of the discourse surround field recording and soundscape research. More on that later. You are interested in the relationship between sound, site and technology. Can you talk about some of the aspects of this relationship and perhaps surprising findings? Over the last 5 years, and in conjunction with my PhD, I have made a collection of pieces which in some way respond to these ideas. Sound, is an obvious one, it is my primary medium. Site and technology is a little more vague! I guess here I am interested in the way that technology and site interact. To give an example I made an installation called Ring Network, which explores the relationship between acoustic and recorded sound and network latency. Three bells are placed in a gallery space and, as they ring, the sound is recorded through a microphone onto the disk of the local computer. These sound files are then sent to different servers in Korea, Iceland and the USA. Once they reach the remote servers, they are then sent back to the exhibition space and played through a speaker at the time it took to travel around the world and back. Here, the latency, the time it took for the sound to go through the whole system, was the creative material of the work, and formed a type of liveness. I hope that this work makes us think about our geographical relationship to the internet and how these technological infrastructures have a very material quality. The internet is not just a virtual space where immaterial things happen. It has consequences dependent upon location and geological distance. Sometimes technology, in art practice, is used as a way to ‘virtualise’ space, to create immersion, to remove the audience from that place and time. For me I am much more interested in how technology and media is used to extend how we experience site and the world we live in. More on that project here. In your work, you appropriate recording and communication technology to consider how these devices change the way we experience the world. Can you elaborate? I think that listening to the world through different acoustic technologies can really effect (or affect) the way we experience it. That might sound obvious, but it can be very striking. The development of recording technologies across the 20th century changed the way we could interact and experience sound. Bernie Kraus said it nicely, ‘amplified sound gave me a way to translate the language of the natural world in ways my ‘civilized’ ears could not’. Through listening and recording I started thinking about how different technologies reveal things within our environments which our naked ear could not necessarily hear. I have creatively experimented with many different types of microphones and also other more, esoteric listening devices, such as Raudive receivers (used for listening to paranormal activity) and earth probes (used to listen to Telluric currents) as well as collecting other environmental changes through experimenting with sensors and data. I have also worked with radio and other communication technologies as a creative medium. In my project, Radio TV, I set up a temporary radio station which only transmitted images for 24 hours. As images are sent across the space, natural interference and interruption alters and distorts the images. More on that project here. Field recording is an area of sound art that has been popular for a long time, with its predecessors going all the way back to the 19th century and beyond. What fascinates you about this discipline, and are you looking for new ideas in this field, or rather something else (like specific textures and their recontextualisations)? I think I find the inherent unpredictability of environmental sound fascinating. Hildegard Westerkamp said ‘Listening implies a preparedness to meet the unpredictable and unplanned, to welcome the unwelcome’. I like the way in which uncertainty and chaos can be creatively productive. This is something I have tried to incorporate into some of my performances, integrating field recording, sound synthesis and generative systems. I also think field recording is a discipline which needs a bit of shaking up from time to time. I am not really so interested in just taking a recording from one place and presenting it in another, moving material from one situation and virtually presenting it somewhere else. Rather, I like to think about field recording as a performative act, something which is performed within an environment, with or without others present. For example, in my piece, Ambulation, which is a headphone sound walk I perform with a small audience, I use field recording technologies and a specially made system to create an improvised composition using sounds encountered during the walk. In this piece I use no pre-recorded material so the composition is only heard during the time of the walk and never repeated, field recording becomes a live performative act. More on that project here. Can you talk about some of the avenues of your work: performance, sound walk, installation, site-specific works, etc? I wouldn’t describe these presentation methods as avenues, I do not see them as separate entities. Actually, they are all interconnected and sometimes my work is all of these things at the same time. The piece I described earlier, Ring Network, for example, was originally intended as an installation but I have since done performance versions of it which have involved walking and site specificity. I am generally interested in creating hybrid performance and installation environments. I was lucky enough to go on tour with Tetsuya Umeda and Dirty Electronics last year, the way that both of these artists create amalgamative performance and installation environments is of real interest to me. You’ve performed at various places, including the History of Bosnia Museum in Sarajevo. I visited this museum a few years ago, and remember the intense, oppressive experience of the space itself combined with the display (particularly the Sarajevo siege during the 90s). What did you do there? Yes, it is a really intense place. The museum has a very interesting collection on display. It is my understanding, that after the conflict, people donated items from that period to the museum as a kind of remembrance. There are many very surprising objects, from DIY radio transmitters to motorised vehicles made from scrap. People’s resilience is really evident in this collection, for me at least. Jacek Smolicki and I were invited to do a performance there. Jacek is someone I have collaborated with a lot over the past three years. We conducted a sound walk and performance composed from a large sound archive of testimonies from the Yugoslav Wars, which is currently based in Belgrade. What are your future plans and projects this year? I have lots of performances coming up including a tour with Phill Niblock. This follows some workshops we are presenting at CAMP in France during April joined by Lea Bertucci, Kara-Lis Coverdale and Jorge Boehringer. I have a research trip planned to Japan in the summer with some performances and a bunch of installation proposals in the pipeline. I am very grateful to MoTA and Sonica for putting me forward for the SHAPE platform and I look forward to working with them in Slovenia later in 2019. I am also going to make time to write some sort of studio album, having left that method of working sometime ago, maybe its time to revisit it. Or maybe not.